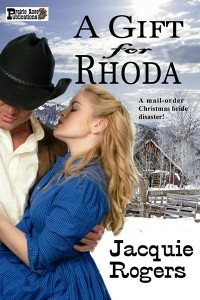 Rhoda Johnson is stranded in a lonely cabin without a groom. The townsfolk say she’s better off without him, but her drunken groom sends a message that he’ll claim her as his Christmas bride. Gunman and ex-Confederate soldier Nate Harmon comes to Idaho to make peace with his abolitionist preacher father. When half-frozen Nate reaches the cabin on a snowy Christmas Eve, instead of his parents, he’s greeted by a pretty blonde with a shotgun who keeps calling him Mr. Snyder. Will she shoot him, or melt his heart?